People have lived around Scalloway for at least 6,000 years, attracted by the sheltered harbour, fertile soil and rich fishing grounds. The first inhabitants came from Scotland, island hopping to Orkney and Fair Isle and onwards to Shetland. Around 5,000 years ago Neolithic settlers started to clear the scrub woodland for fuel. Regeneration of the woodland was prevented by a worsening climate and the grazing of sheep. About 2,400 years ago, Iron Age peoples built massive stone towers or brochs. There were three in the Scalloway area. Vikings began to arrive in Shetland from Norway around AD750. The name Scalloway (Old Norse: skálivágr) means the site of a Viking hall or ‘booths’. These provided accommodation for the Norse settlers from all over Shetland who attended the annual ‘althing’ or parliament held in the nearby Tingwall valley. ​On the marriage of King James III to Princess Margaret, daughter of King Christian I of Norway-Denmark, Shetland and Orkney were pledged for part of the marriage dowry. In 1472, with the pledge still outstanding, Scotland annexed Orkney and Shetland and the islands came under Scottish rule. Patrick Stewart, Earl of Orkney and Lord of Shetland, built Scalloway Castle in 1600, beginning centuries of almost feudal rule. Patrick was executed in Edinburgh in 1615. Scottish dominance was increased by the influx of Scots from the Scottish mainland in the late 16th century with many of the incoming clergy and landowners acquiring large areas of land. The descendants of the 8th century Norse settlers were no longer free men but tenants on their own land and the old Norse laws and language began to disappear. 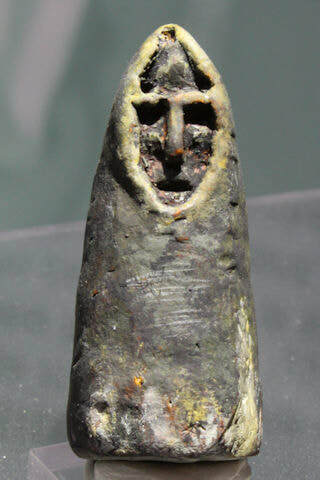 ​One of our exhibits from ancient Scalloway. ​This button mould, which is intricately carved from steatite (soapstone; or *kleber* in Shetland dialect), would have been used from Mediaeval times to cast buttons. Animal horn was the most likely material. After softening in boiling water, the horn would be pressed into the mould and left to harden. Buttons could also have been made from metals with low melting points (e.g. silver and pewter).